A police officer and another man were killed in mob violence in Bulandshahr. 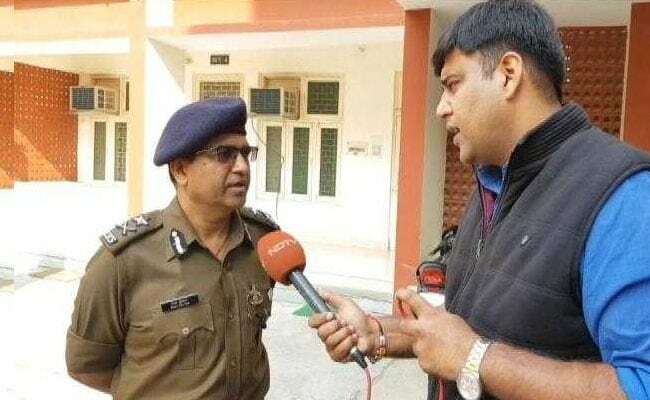 Meerut: Three days after an Uttar Pradesh inspector was murdered in mob frenzy over cow slaughter allegations, the main accused, Yogesh Raj, remains missing. Three have been arrested. Four others arrested since the Monday incident are accused in a separate case of cow slaughter, which was filed by Yogesh Raj. Yogesh Raj, a Bajrang Dal activist, has sent out a WhatsApp video proclaiming his innocence. Inspector General Ram Kumar said evidence was required for the police to act. “We can only act on evidence. We need to forensically tests. It is not clear who shot the police officer, who shot Sumit (the second man killed in mob violence),” the police officer told NDTV. A video shows Yogesh Raj saying that he was at a local police station when the violence broke out. “But who was behind cow slaughter…who was behind the cow conspiracy. This is a bigger question than catching a person who’s on video, against whom there is no forensic proof…” Ram Kumar said. The comments appeared to reinforce the impression that the police and administration had instructions to prioritise investigations and arrests in the cow slaughter case. Chief Minister Yogi Adityanath, chairing a review meeting after being criticised for attending a sound-and-light show and a kabaddi event after the horrific mob killing in his state, has ordered immediate arrests for cow slaughter, according to a government statement. The seven accused in the cow slaughter case include two boys, 11 and 12. Mr Kumar said it had been found that only one of them is a child and his name had been removed. The other “boy” turned out to be 26, and has been arrested.